Our Astrology Calendars for 2019 Are Available Now! 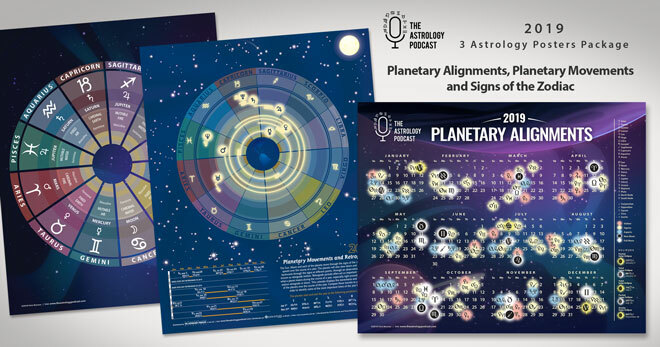 I’m excited to announce that The Astrology Podcast has released a new set of our astrology calendar posters for 2019! With these posters you can easily look up where the planets will be during different parts of the year at a glance, when they will move into different signs of the zodiac, station retrograde, and more. It is similar to the artwork we use on the monthly forecast and horoscope episodes, except the posters display the transits for the entire year ahead. These posters are being released in a bundle, together with a third poster that features a high quality illustration of the signs of the zodiac and their qualities. The sizes have been enlarged from last year’s versions, with each one now measuring 20×16, all printed on high quality matte finish paper. The three-poster bundle costs $19.95 + shipping, and we have already started shipping orders this week! If you have any questions email Chris at astrologue@gmail.com.